For many years Egyptology was dominated by very traditional male academics who had little regard for women or their role in Kemite society. More recently, just as we have seen an increase in the numbers of scholars who approach this subject from a non-Eurocentric perspective, so too have we seen both male and female academics adopting feminist approaches to the study of women. In Kemet, the role that a woman played and the degree of autonomy which she enjoyed was very much dependent on her status in society. On the few occasions when women traversed their traditional roles, artists often struggled to represent them. And at times, powerful women were presented in a secondary role according to the traditions of the time. 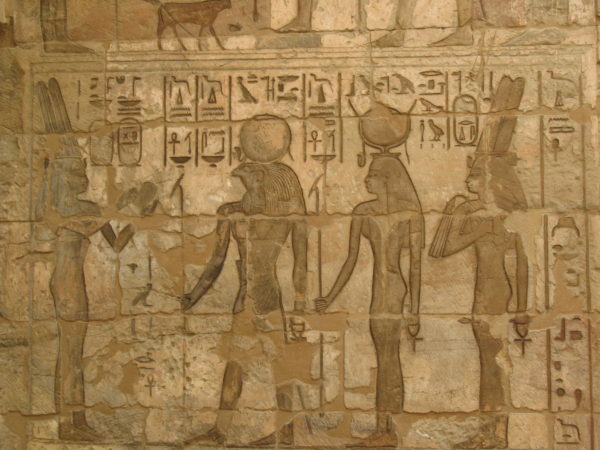 The photograph above is of a type of object that we call a stela (plural stelae). It is a dedicatory relief and these object were used in religious and funerary contexts. I hadn’t seen this particular example before, and so was very excited when Dr Runoko Rashidi sent me the photograph. Why? Well because of the female royal figure is standing in front of the male. This is highly unusual in Kemite art. 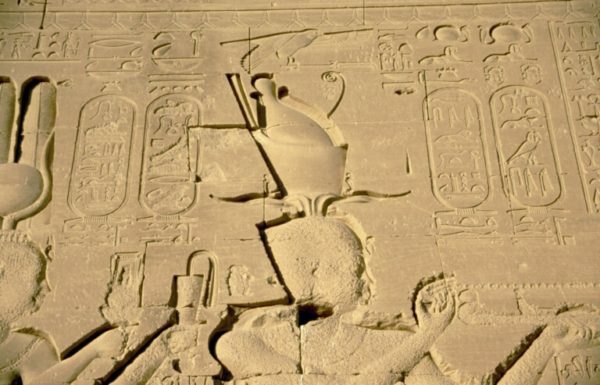 Even Cleopatra VII, arguably one of Kemet’s most powerful female rulers both at home and overseas, stands behind her son on the famous relief on the South Wall of the Temple of Hathor at Denderah (above). Inside the temple there are representations of the ruler by herself. However, the inner walls would only ever have been seen by the priests. 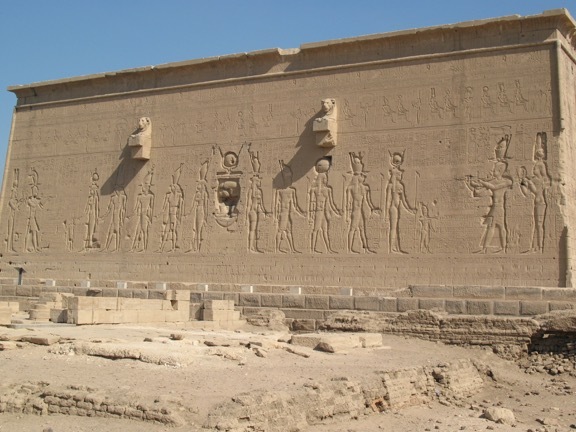 The outer wall is much more of a public space to promote Cleopatra and her son as co-rulers fulfilling their royal and divine duties. 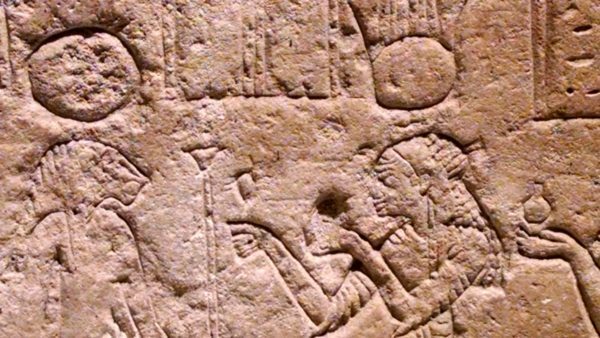 So what is different about the female figure on this particular stela? The relief can be dated on stylistic grounds to around 116 BCE to 30 BCE, and is therefore Ptolemaic. 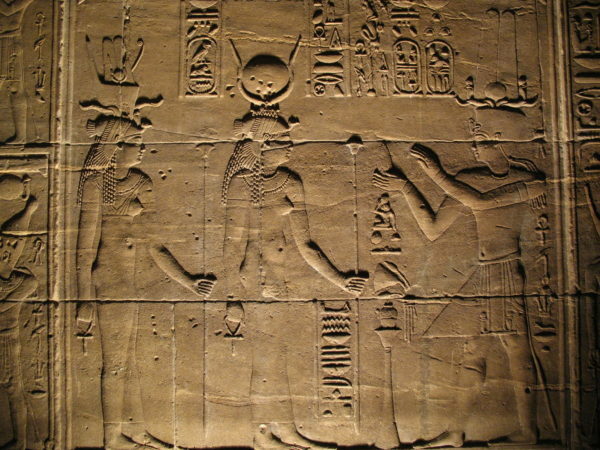 The female figure has to represent either Cleopatra III or Cleopatra VII, who both ruled with their sons. What is unusual is that the female stands in front of her male consort. The answer, as always, is in the iconography (the symbols that identify individuals in Kemet). If you look closely at what she wears on her head in the detail above you will see that she wears a vulture headdress. I mentioned this in an earlier post, the vulture cap is only worn by goddesses. This figure represents a divine queen and whereas all members of the royal family were seen to be divine by association with their roles, this figure is a goddess and has cults in her own right. Divinity outweighs gender when it comes to the hierarchy of representations in Kemet. 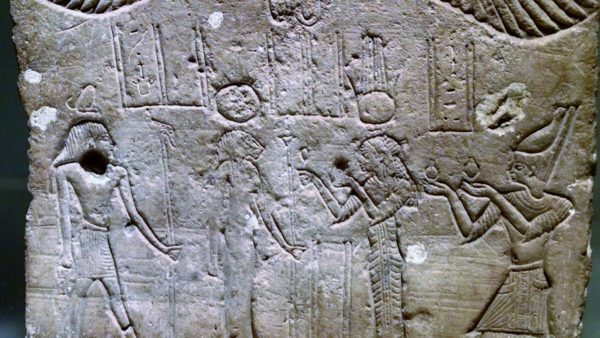 On the relief above we see an earlier Ptolemaic ruler making an offering to Isis; behind Isis is the newer goddess Arsinoe. Arsinoe waited until her death to be defied. However, both Cleopatra III and Cleopatra VII declared themselves to be living embodiments of Isis and both women had their own cults. The relief that we began with has to represent one of these two queens. Both ruled with their sons. Both were goddesses in their own right. Both were extremely powerful. And although these royal women ruled late in Kemet’s history and their families were European, they embraced the traditions of the older culture and were keen to be presented accordingly. And they had numerous role models to choose from. Prior to the Ptolemaic period, Kings of Kemet had more than one wife. Principal Wife was a title that elevated the mother of the heir to the throne. In Dynasty 18 a new iconography appeared for royal women who were Principal Wives: two cobras on their brow rather than one. 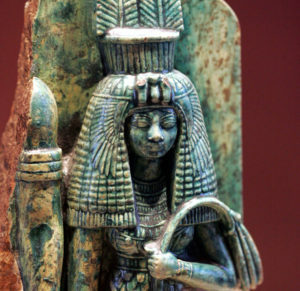 Detail of a statuette of Tiye, wife of Amenhotep III. Louvre, Paris. On the small faience statuette above, representing Tiye, the royal wife wears two cobras on her brow with a vulture head in the centre. If you look closely you can see the vulture’s wings on top of her braided hair. This distinguished her as the Principal Wife and also a goddess. The same iconography can be found later in Dynasty 25. During this period a number of the Kushite royal women in Kemet were presented as the Wife of the god Amun. In this role they received political power and wealth and were designated as goddesses, and the Wife of Amun also chose her successor from the women of the royal family. 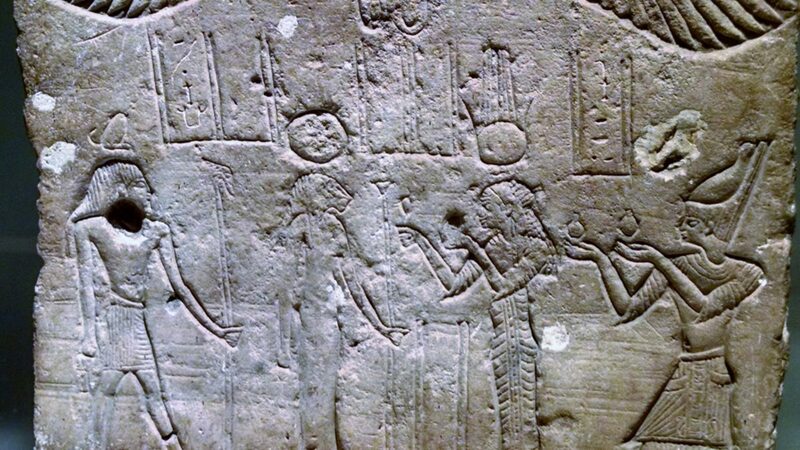 This role is represented on the small chapel of Amenirdas at Medinat Habu, where the Divine Wife Amenirdas receives offerings from her successor Shepenwepet (below). By adopting specific roles, the royal women of Kemet elevated their status and power. The Chapel of Amenirdas dates to around 747-656 BCE, over 600 years before the stela (relief) that I began this post with. It was, however, in Kush where royal women were presented as equals to their male consorts. 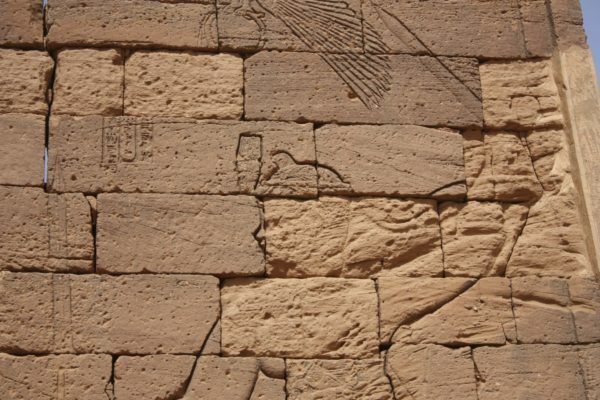 On the pylon (gateway) of a temple to the lion god Apademak that was built in the first century BCE, the Kandake (Queen) Amanitore of Kush appears with a weapon, attacking the enemies of the state (below). This role is reserved for men in Kemet. I would like to Dr Runoko Rashidi for suggesting the subject of this post and for providing me with the photograph of the stela. All views in the post are my own. What about the mummy they found as Queen Tiye. Do you believe that the one found is real? Well the mummified remains are certainly genuine, and if the DNA evidence is correct then the person belonged to the this strand of the royal family. However, I don’t believe that they can prove definitively that the body is that of Tiye, or any other individual. There was considerable doubt before the tests were undertaken because of the circumstances of the burial. Were all the Cleopatra’s European? Hi Daryl, the grandmother and mother of the famous Cleopatra (who we refer to as the seventh) were not Macedonian royals and it has been suggested that they were Egyptians. A few years ago a tomb in Ephesus (Turkey) that was believed to belong to Cleopatra’s sister was excavated and the skull suggested that the occupant was of mixed heritage, because there were features that were typical of indigenous African peoples. In terms of how they presented themselves, although the Ptolemies were originally from Macedonian Greece by the time of the fifth ruler (there were 15 including Cleopatra VII’s son) the royal family were shown predominantly in a traditional Kemite way.